Middle Grade Author Panel at Books of Wonder in NYC! Posted on November 13, 2014 by Mr. H Posted in Events	. Hey, you! Gonna be in New York City on Saturday, 11/22? Stop by Books of Wonder to see an epic author panel, featuring me, Geoff Rodkey (The Chronicles of Egg), Tim Carvell (Planet Tad), Isaiah Campbell (The Troubles of Johnny Cannon), Tom O’Donnell (For the Love of Gelo! ), and Tommy Greenwald (Charlie Joe Jackson’s Guide to Making Money!). We author folk will answer questions, sign books, and probably say some goofy stuff. Check it out! Posted on April 17, 2014 by Mr. H Posted in Events	. Going to be in New York City on Saturday, April 26th? Come see me at the Tribeca Family Festival—the kid-friendly component of the Tribeca Film Festival! You can find me at the Real Simple magazine tent. I’ll be doing story time (creating new stories from scratch with the audience) at 10:30am, 11:30am, and noon. Stop by to take part in the adventure. Or just to say hi! Posted on October 19, 2012 by Mr. H Posted in Events	. The inaugural leg of HarperCollins’s Class Acts Tour was a smashing success! Jon Scieszka, Christopher Krovatin, and I had some of the most awesome audiences ever, so we need to send a big thank you to the kids, teachers, and librarians at Noecker School in Roseland, NJ, Union School in Rutherfor, NJ, and Lafayette Elementary, Capitol Hill Day School, Landon School for Boys, St. Andrew’s Episcopal School, The British School, and Sheridan School (all in Washington, DC). Thanks also to the fantastic bookstores involved: Books, Bytes, and Beyond in Glen Rock, NJ, Politics & Prose in D.C., and Barnes & Noble Princeton. It was one heck of an amazing week. I’m done with the tour as of now, but it continues on to Southern California, Texas, and Chicago schools with a whole slew of other great writers. Check the HarperCollins website to see if the tour is coming to a school or bookstore near you. Jon Scieszka, me, and Chris Krovatin after one of our astoundingly successful Class Acts events. The Princes Charming Take Portland! Posted on October 12, 2012 by Mr. H Posted in Events	. The Princes Charming take Portland, Oregon this weekend! And then on Sunday, it’s Wordstock Festival time! Christopher Healy and Jackson Pearce (Sisters Red) discuss how classic fairy tales have influenced their novels, and explore the different ways to approach a modernized fairy tale. Posted on October 1, 2012 by Mr. H Posted in Events	. I’ll be in Portland, Oregon, on Saturday, 10/13, for a reading and Q&A at Green Bean Bookstore (1600 NE Alberta Street, Portland, OR 97211). Then find me the next day, Sunday, 10/14, at Portland’s WORDSTOCK FESTIVAL. I’ll be doing a presentation and signing with “Emerald Atlas” author, John Stephens, at 2PM, then taking part in a “Fractured Fairy Tales” panel discussion with “Fathomless” author, Jackson Pearce at 4:30PM. 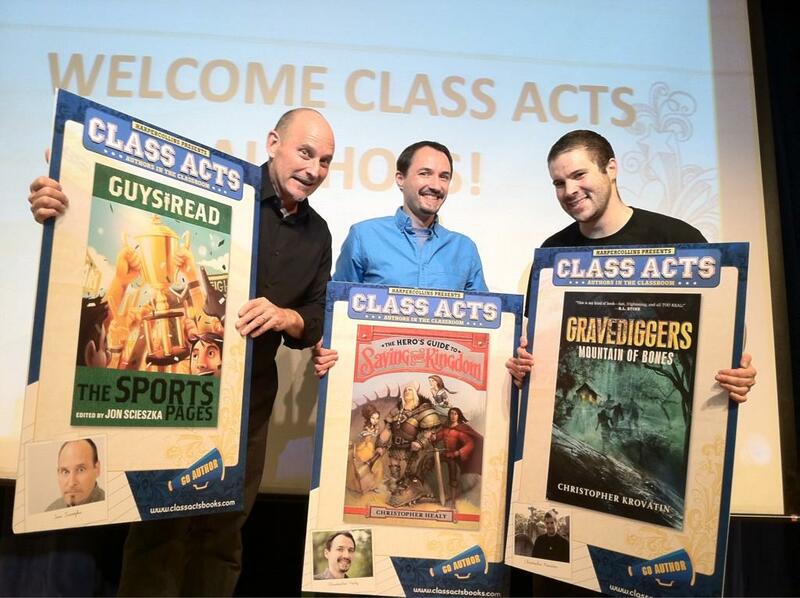 The following week, I’ll be traveling with “Gravediggers” author, Christopher Krovatin, and all-around classic kid-lit guy, Jon Scieszka, on HarperCollins’s “Class Acts” tour. We’ll be appearing at schools from 10/16–10/18 (Full schedule soon to come), with a bookstore event on Tuesday, 10/16 at the Princeton, NJ, Barnes & Noble. at 7PM. (Very Early) Book signing at Public Library Assoc. Conference in Philadelphia! Posted on March 2, 2012 by Mr. H Posted in Events	. Yes, The Hero’s Guide to Saving Your Kingdom doesn’t come out until May 1st, but library folk looking for an early signed copy can find me at the HarperCollins booth at the Public Library Association Conference at 3:30 on March 14th. The conference will be held at the Pennsylvania Convention Center in Philadelphia.